Reducing misinformation, one URL at a time, Bloomberg, 31 January. Organiser of the London Text Analytics meetup. Rule-based systems and deep neural nets, Signal Media, 28 February. Organiser of the London Text Analytics meetup. Text Analytics Projects at Shell, Shell, 21 Mar. Organiser of the London Text Analytics meetup. Think outside the search box, Essex University, 29 June. Invited speaker at CSEE Industry Day. July meetup at Accenture, London 04 July. Organiser of the London Text Analytics meetup. Rethinking advanced search, Essex University, 02 August. Keynote speaker at Big Data and Analytics Summer School. 2dSearch: a visual approach to search strategy formulation. Bertinoro, Italy, 28-31 August. Paper presented at Design of Experimental Search & Information REtrieval Systems conference. Search Usability – Filters and Facets, CILIP London, 18 September. A one-day training course on behalf of the UKeIG. A visual approach to search strategy formulation. London, 2 October. Presentation at Haystack Europe. Think outside the search box London Olympia, 17 October. Presentation at Taxonomy Bootcamp London. Designing Search, BCS London, 26 November 2018. Tutorial at Search Solutions 2018. Reimagining advanced search, BCS London, 27 November 2018. Presentation at Search Solutions 2018. New Year meetup, Signal Media, 01 February 2017. Organiser of the London Text Analytics meetup. Life Sciences Special, Babylon Health, 22 February 2017. Organiser of the London Text Analytics meetup. Industry Day at European Conference on Information Retrieval 2017. RGU, Aberdeen, Thursday 13th April 2017. Co-organiser and co-chair. Search Usability – Filters and Facets, London, 10 May 2017. A one-day training course on behalf of the UKeIG. User Experience in IR, Universitat Pompeu Fabra Barcelona, 4-8 September 2017. Invited lecturer at 11th European Summer School in Information Retrieval. Designing Search, BCS London, 28 November 2017. Tutorial at Search Solutions 2017. Search Solutions 2017, London, 29 November 2017. Co-chair of the 10th Search Solutions conference, focusing on innovations in search and information retrieval. Sentiment Analysis Special, Level39, One Canada Square, 14 March 2016. Co-organiser of the London Text Analytics meetup. Real-world expertise retrieval: The information seeking behaviour of recruitment professionals, University of Padua, Italy, 21 March 2016. Presenting short paper at ECIR 2016. Thinking outside the search box: a visual approach to complex query formulation, University of Padua, Italy, 23 March 2016. Presentation at ECIR 2016 Industry Day. Search Usability – Filters and Facets, London, 25 May 2016. A one-day training course on behalf of the UKeIG. Text analytics applied to biomedical relation extraction and social media, Benevolent AI, 7 November 2016. Organiser of the London Text Analytics meetup. Search Usability – Filters and Facets. London, 12 October 2016. A one-day training course on behalf of the UKeIG. November meetup: Retechnica and EMA, Elsevier, 7 November 2016. Organiser of the London Text Analytics meetup. Designing Search, BCS London, 29 November 2016. Tutorial at Search Solutions 2016. Search Solutions 2016, London, 30 November 2016. Co-chair of the 10th Search Solutions conference, focusing on innovations in search and information retrieval. Searching for Talent, University of Essex, 06 December 2016. Invited talk as part of the Dept of Computer Science seminar programme. Measuring linguistic diversity in historical corpora, University of London, 23 March 2015. Presentation given as part of the Traces through Time final conference. Search Usability – Filters and Facets. London, 13 May 2015. A one-day training course on behalf of the UKeIG. Expertise retrieval, University of Glasgow, 12 October 2015. Invited talk as part of the Dept of Computer Science seminar programme. Supporting Search, City University London, 18 November 2015. Guest lecture on City University’s Information Architecture module. 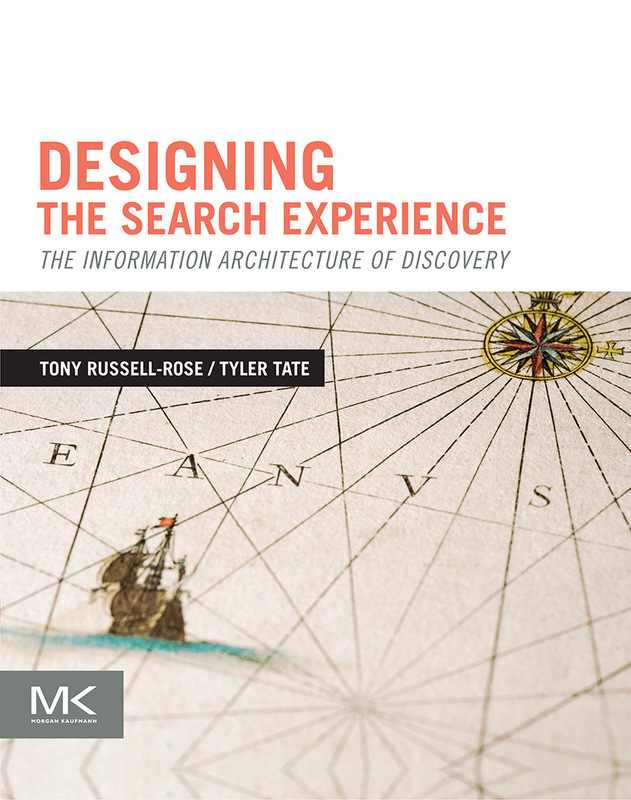 Designing Search, BCS London, 25 November 2015. Tutorial at Search Solutions 2015. Search Solutions 2015, London, 26 November 2015. Co-chair of the 9th Search Solutions conference, focusing on innovations in search and information retrieval. Introduction to Information Architecture, University of West London, 26 February 2014. One day training course presented at the SCIUX centre. Designing Search Usability, University of Amsterdam, Netherlands, 13 April 2014. Tutorial at ECIR 2014. Enterprise Search Europe 2014, London, UK, 28-30 April 2014. Presenting a workshop on Search Interface Design. Search Usability – Filters and Facets. London, 14 May 2014. Giving a one-day training course on behalf of the UKeIG. EuroHCIR 2014 The 3rd European Workshop on Human-Computer Interaction and Information Retrieval, London, 13 Sept. 2014. Co-chair of this event with Max Wilson, Birger Larsen, Kristian Norling and Preben Hansen. The Language of Discovery, Copenhagen, 11 Sept 2014. Invited speaker at Findwise Findability Day. Designing Search Usability, London, 26 November 2014. Tutorial at Search Solutions 2014. Search Solutions 2014, London, 27 November 2014. Co-chair of the 8th Search Solutions conference, focusing on emerging applications in search and information retrieval. Search Solutions 2013, BCS London, 26-27 November 2013. Co-chair of the 7th Search Solutions conference, featuring presentations, panels and keynote talks by influential industry leaders on novel and emerging applications in search and information retrieval. Search Usability – Filters and Facets. York, 20 November 2013. Giving a one-day training course on behalf of the UKeIG. EuroHCIR 2013 The 3rd European Workshop on Human-Computer Interaction and Information Retrieval, Dublin, Ireland, 1 August 2013. Co-chair of this event with Max Wilson, Birger Larsen, Kristian Norling and Preben Hansen. Designing Search Usability, Trinity College Dublin, Ireland, 28 July 2013. Tutorial at SIGIR 2013. Search and interaction in media archives, Copenhagen, Denmark, 27 June 2013. Invited speaker in open seminar at Danmarks Radio while on sabbatical at the Royal School of Library and Information Science. Enterprise Search Europe 2013, London, UK, 15-16 May 2013. Presented workshop on Search Interface Design. Designing Search Usability, Palais de Congrès de Paris, France, 2 May 2013. Tutorial at CHI 2013. PROMISE Technology Transfer Day, CeBIT, Hanover 5-6 March 2013. Invited speaker. Search Solutions 2012, BCS London, 28-29 November 2012. Co-chair of the 6th Search Solutions conference, featuring presentations, panels and keynote talks by influential industry leaders on novel and emerging applications in search and information retrieval. Search Usability – Filters and Facets. London, 18 October 2012. Giving a one-day training course on behalf of the UKeIG. EuroHCIR 2012 The 2nd European Workshop on Human-Computer Interaction and Information Retrieval, Amsterdam, 25th August 2012. Co-chair of this event with Max Wilson, Birger Larsen and James Kalbach. IRF Conference, Information Retrieval Facility, Vienna, Austria, 1st July 2012. Presented a tutorial on Designing the Search Experience. Enterprise Search Europe 2012, Hilton London Olympia, 31 May 2012. Presented talk on A Taxononomy of Site Search. ECIR 2012, Pompeu Fabra University, Barcelona, Spain, 1st April 2012. Presented a half day tutorial on Designing the Search Experience. Search Solutions 2011, BCS London, 16 November 2011. Co-chair of the 5th Search Solutions conference, featuring presentations, panels and keynote talks by influential industry leaders on novel and emerging applications in search and information retrieval. CIKM 2011 Industry Event, Crowne Plaza, Glasgow, Scotland, 27th October 2011. Daniel Tunkelang and I co-chaired this event which brings together leading researchers and developers from the database, information retrieval, and knowledge management communities. Enterprise Search Europe, London, UK, 24-25th October 2011. Programme committee member for this event, chaired by Martin White. A Taxonomy of Enterprise Search. Paper presented at EuroHCIR 2011 The 1st European Workshop on Human-Computer Interaction and Information Retrieval, Newcastle, UK, 4th July 2011. Co-chairing this event with Max Wilson, Birger Larsen and James Kalbach. Designing the Search Experience, IRF Symposium, Vienna, Austria, 7th June 2011. Presenting the Keynote talk in the User Interfaces Session. From Search to Discovery: a taxonomy of search tasks, modes and activities, Open University, 1st June 2011. Presenting a short talk to the Knowledge Media Institute. Designing Effective Search and Discovery Experiences, Guinness Storehouse Conference Centre, Dublin, Ireland, 18th April 2011. Presenting a half day tutorial at ECIR 2011. ECIR 2011 Industry Day, Radission Blu Royal Hotel, Dublin, Ireland, 21st April 2011. Co-chairing (with Udo Kruschwitz) a topical selection of talks, panels and case studies from the world of search and information retrieval. From Search to Discovery: Towards a taxonomy of human-information seeking behaviour, Microsoft Research, Cambridge, UK, 11th April 2011. Presenting a short talk to the Cambridge Usability Group. Search Solutions 2010. BCS London HQ, Covent Garden, Thursday 21st October 2010. Introducing and chairing the BCS annual conference focused on the latest innovations in web & enterprise search. Inaugural Meeting of the London Text Analytics Group, Fizzback Ltd, London, 18th August 2010. Featuring a talk from Udo Kruschwitz and drinks afterwards. ECIR 2010 Industry Day, Open University, Milton Keynes, 1st April 2010. Udo Kruschwitz and I are co-chairing a topical selection of presentations, panels and case studies from the leading figures in search and information discovery, with the emphasis on practical problems and real-world solutions. Designing Effective Search User Experiences, Open University, Milton Keynes, 28th March 2010. Presenting a half day tutorial at ECIR 2010. Enterprise Search London March Meetup, Skinkers, London, 3rd March 2010. Giving a presentation on design patterns for search& information discovery. Search Solutions 2009. BCS London HQ, Covent Garden, 1st October 2009. Introducing and chairing the BCS annual conference focused on the latest innovations in web & enterprise search. Designing Effective Search and Discovery User Experiences, Cambridge University, 4th September 2009. Presenting a half day tutorial at HCI 2009. UI Design Patterns for Search & Information Discovery, BCS Covent Garden, 1-2 July 2009. Presenting a paper at Create 2009.